A luxury family reunion, bachelorette, or event is up to you to organize? 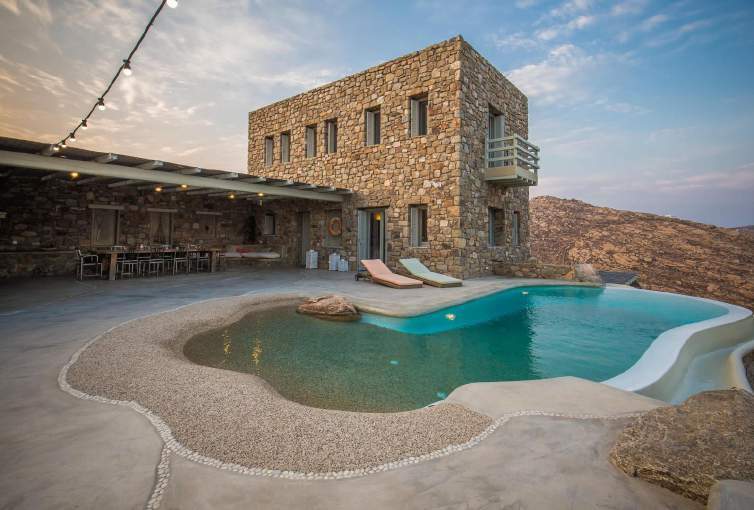 Say no more and welcome to Villa Callisto, your summer luxury home in Mykonos. The complex consists of 2 detached villas that can sleep 24 people. It lies in Agrari, only 280 m from the beach, though the pools will amaze you as well! Admire the architecture of the villa that blends perfectly with the breathtaking view and indulge in its amenities. There is plenty of space to relax both inside and outside, but we ‘d recommend the exterior as it can guarantee amazing selfies! Not to mention that after the sunset, things get serious. You can host your party, since the patio and BBQ make it perfect for the occasion. The complex has extensive terraces and patios to stroll or relax, so is it is ideal for parties. In case you are in a wilder mood, then you’d better discover for yourself Mykonos nightlife in the town, which is only 5.7 km away. Pick your group and enjoy!